The May 2017 issue of Tabletalk will mark the magazine’s fortieth anniversary by highlighting several of the key theological convictions that fuel the mission of the magazine and of Ligonier Ministries. For forty years, Tabletalk has endeavored to proclaim the key truths of Reformed theology because, with Charles H. Spurgeon, we believe that Reformed theology is just another name for the teaching of sacred Scripture. 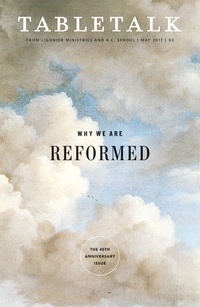 To help readers better understand Reformed theology and to commemorate four decades of publishing, this issue will cover major aspects of Reformed doctrine and explain that the reason Tabletalk holds to them is because they are taught in the Word of God. Contributors include R.C. Sproul along with Derek W.H. Thomas, Stephen J. Nichols, W. Robert Godfrey, Steven J. Lawson, Sinclair B. Ferguson, and Burk Parsons.